The portable batteries from New Trent focus on unique cases and high capacity. One case, the PowerPak Ultra, is even water resistant, making it ideal for outdoor activity. However, New Trent only covers its batteries with a 10 month warranty compared to 18 months from Anker and 12 months from other battery manufacturers. In the following reviews, we’ll see if New Trent’s innovative designs are worth the risk of a malfunctioning battery. View New Trent’s comparison summary chart. 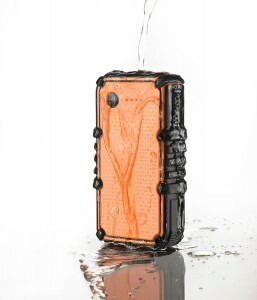 The highest capacity battery available from New Trent with a rugged case that’s water-resistant – according to the manufacturer, it can be submerged in three feet of water for up to an hour with no ill effects. Although it’s a fairly large battery, this could be the ideal portable battery for hikers, long-distance bicyclists, and everyone else who spends extended time outdoors where the weather is never certain. 14,000 milli-amp hours (mAh), which should be enough to fully recharge a 2,440-mAh iPhone 5S nearly six times. However, the PowerPak Ultra has the worst efficiency rating of any battery we’ve reviewed – only about 60%. 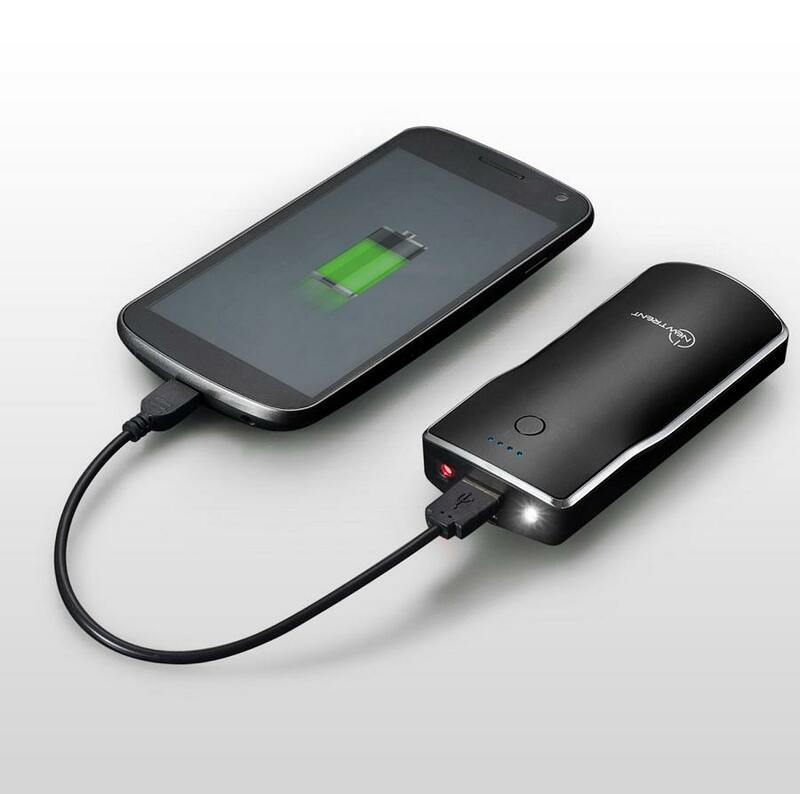 That means its usable capacity is only 8,400 mAh (3.5 iPhone 5S charges). Compare that to the Anker Astro E5 (second generation) portable battery which has 15,000 mAh and an 80% efficiency for a usable capacity of about 12,000 mAh. Two charge ports, a 2.1-amp port which can charge recent smartphones and tablets at full speed plus a 1.0-amp port which can simultaneously charge another USB device at standard USB speeds. 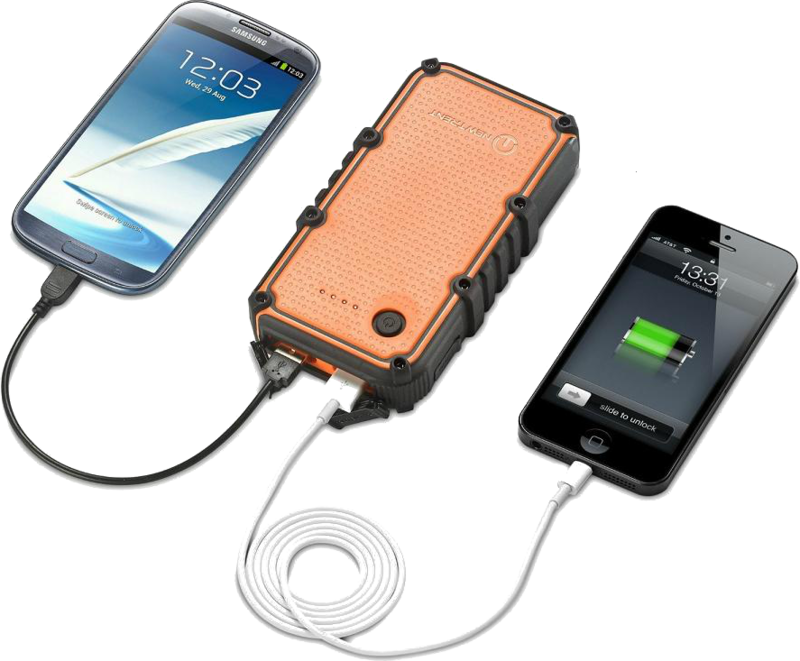 This is perfect for camping trips where everyone needs to charge their phones at the end of the day. 5.6 inches long by 3.1 inches wide by 1.1 inches thick, making this battery fairly small despite its rugged and scratch-resistant case. It weighs 13.0 ounces – a bit less than a pound and is available in orange with black highlights. It comes with a micro-USB charge cord. Except for the low efficiency, this is an excellent battery that should be considered by anyone who has to deal with rain and other modest amounts of water. It is a bit bulky, but it has the capacity to get you through several days without electricity. On the other hand, you may want to look at one of the high-capacity Anker or EasyAcc batteries and just put it in a Zip-Lock bag. The ultimate cause is unknown, but it may have something to do with the built-in water-resistant parts having a higher electrical resistance than the parts built into the traditional batteries from New Trent and other battery manufacturers. It could also be an design problem that will be fixed in a later upgrade. Although its rated for 3 feet of water for up to 1 hour, you might drop it in a 5-foot deep lake for one minute. It’s hard to tell whether that will ruin it, but the best course of action after the PowerPak Ultra spends any time in the water is to let it fully dry. (Giving it a day or more to dry is ideal.) After that, you want to fully charge it under supervision – connect it to your laptop while you’re working and monitor the cord for excess heat (indicates a short circuit) and the Ultra itself for excess heat (an indication the Lithium-Ion-Polymer battery isn’t charging correctly). In any case, if you feel excess heat, you must safely dispose of the battery at a recycling center – do not use it further or the polymer battery could burst and spill hot, toxic, and combustible lithium on you. Maybe. U.S. airport security regulations state that a lithium-ion battery must be attached to a device in order to be carried on to a plane. (This is because overheated lithium-ion batteries are mildly explosive and if they catch on fire, they can theoretically melt through metal.) It’s not clear from the policy whether a portable battery device like this counts as a battery or as a battery attached to a charger, so it’s up to your particular security officer to decide. In general, smaller portable batteries are almost always allowed but larger batteries like the PowerPak Ultra may be forbidden as carry-on. A smartphone-shaped portable battery much like offerings from Anker and Jackery, the PowerPak 11.0 will fit into pockets designed for smartphones while holding enough power to fully recharge typical smartphones four or more times. With a simple and stylish black matte finish, this portable battery looks great and works great. 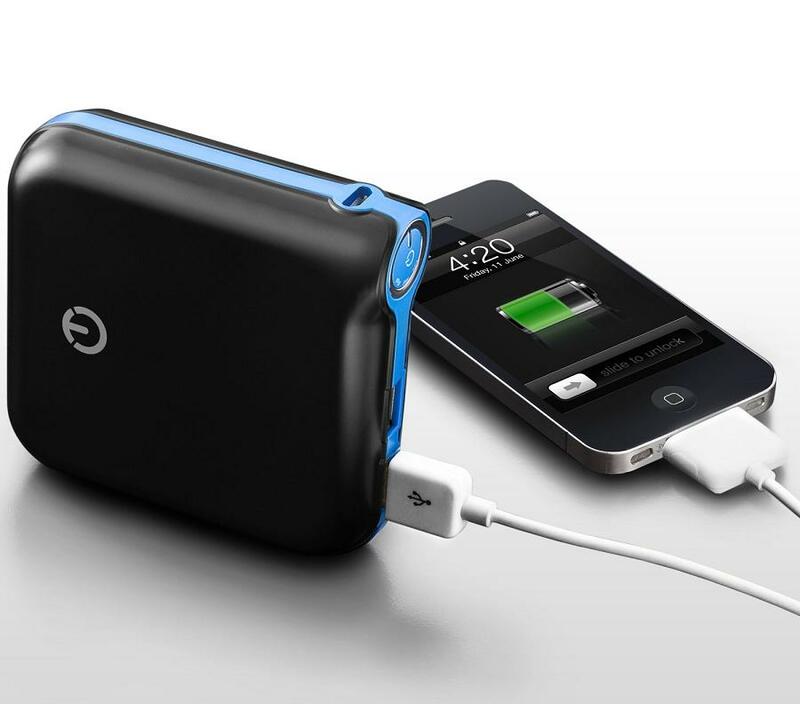 11,000 mAh capacity, which is almost enough to fully recharge the iPhone 5S four times. Unlike the PowerPak Ultra, this battery has an 80% industry-standard efficiency, so the rated capacity is pretty close to what you actually get. Two charge ports, a 2.1-amp port and a 1.0-amp port so you can charge two devices simultaneously. The 2.1-amp port is ideal for recent smartphones and tablets which allow for high-speed charging. 5.2 inches long by 2.4 inches wide by 0.9 inches thick, making it a fair bit smaller than the Ultra’s ruggedized case. It weighs 8.2 ounces – about double an iPhone 5S. This battery looks so much like a smartphone that you’re likely to pick it up by accident and start swiping at it. Its fingerprint-resistant black matte finish with a single blue highlight is both nice to look at and to hold in your hand. It includes a micro-USB charge cord. It depends on what device you want to charge. The PowerPak 11.0 comes with a micro-USB cord which you can use to charge the PowerPak from any modern computer or laptop. If you want to charge the PowerPak from the wall, you will need a USB wall adapter. (You should look for one that provides high-speed charging of at least 2 amps to charge the PowerPak at its maximum speed.) If your device has a micro-USB port, you can use the same cord to charge it. If your device charges by any other port, such as a mini-USB, Apple 30-pin, or Apple Lightning connector, you will need a standard USB charge cord for your device. For some devices, you may also want a charge-only adapter which will let you charge the device at its maximum speed. Technically, yes – but the manufacturer recommends against this. Using the device like this is called pass-through charging, and it can significantly reduce the lifespan of devices not designed for it. In a worst case scenario, it can overheat your battery and destroy it within minutes. For a battery designed for pass-through charging, take a look at some of the Innergie batteries. You can charge the PowerPak 11.0 at a maximum of 2,000 milli-amps per hour at it holds 11,000 milli-amps, so it will charge from zero in about six hours if you have a max-speed charger. (If not, it will take about eleven hours.) It will charge your device up to its max of 2,100 milli-amps, so divide your device’s capacity by 2,100 to get the number of hours. For example, an iPhone 5S with a 2,400 mAh capacity should fully charge in a bit over an hour. New Trent’s flagship battery which is now in its third generation with more capacity but the same novel shape and attractive look. Shaped in to a square, the iCarrier is excellent for anyone who doesn’t have a lot of space but wants a high-capacity portable battery. It has the same high-quality black matte finish of several other New Trent batteries and the ability to charge two USB devices at the same time. 12,000 mAh, which is enough to fully recharge an iPhone 5S about five times or an iPad 3 about 80%. The efficiency on this battery is about 80%, which is the industry standard (although some second-generation Anker devices are about 5% more efficient). Like the PowerPak 11.0, the iCarrier has 2.1-amp and 1.0-amp charge ports so you can recharge a recent tablet at full speed and a phone or other device at USB 2.0 standard speed. Unlike cheaper devices from Anker or EasyAcc, charging both devices at the same time does not slow down the advertised charge rate – you get the full 3.1 amps whenever you need it. 3.9 inches tall by 3.6 inches wide by 1.1 inches thick at its thickest (thickness varies slightly near the top). It weighs 9.8 ounces, so almost two extra ounces for an extra 1,000-mAh compared to the PowerPak 11.0. It includes a micro-USB charging cord. Although it’s probably a little bit heavier than it could be, this is still possibly the only portable battery on the market with a square shape, so if you have a square pocket or other square place which isn’t being used, this could be the perfect battery for you. 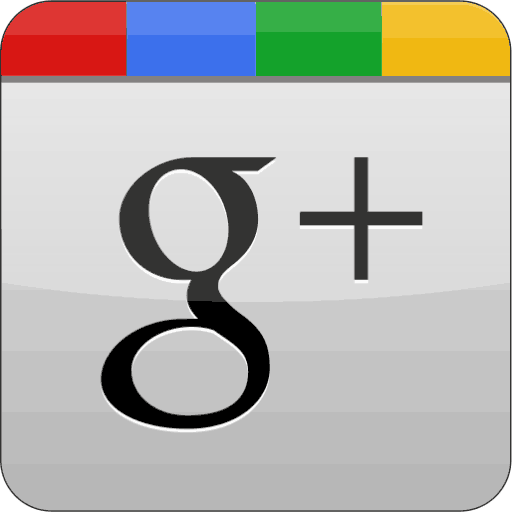 About 1 in 20 according to a survey of Amazon.com reviews, although reviews tend to be biased towards the negative – happy customers are more likely to forget to leave a review. The most commonly reported problem was that the battery wouldn’t charge the intended device. Some of these problems could have been the result of a bad cord, a bad connection, a device which doesn’t support charging from portable batteries, or because an overload was detected. The New Trent batteries go through a circuit reset procedure every time you charge them, so if your iCarrier stops working suddenly, just try recharging it for 20 seconds and maybe try using it with a different cord or device. No. Laptops run on much higher voltage and amperage than the iCarrier or any of the New Trent batteries. In addition, all the batteries reviewed here only have USB output, and laptops cannot be charged over USB. (However, the iCarrier does work even with large-screen tablets like the iPad 3.) 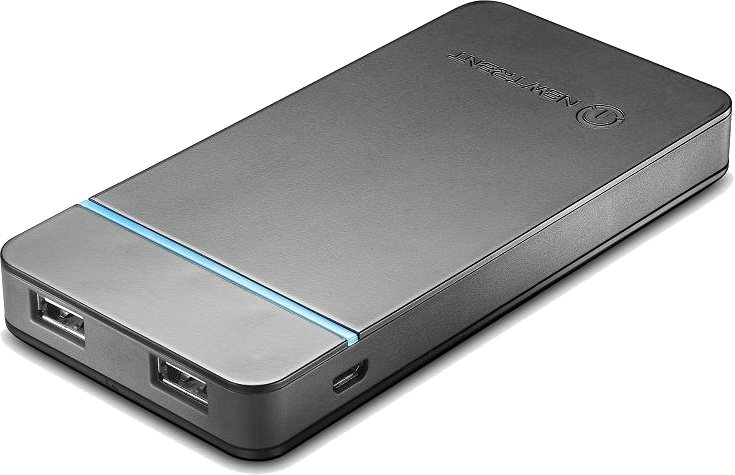 If you want a portable battery that can charge your laptop, look at the Anker Astro Pro series. According to New Trent, 500 times. This is the standard number of full recharges you can expect from an lithium-ion battery, so it’s the exact same number of recharge cycles advertised by Anker, Jackery, Innergie, and EasyAcc for their portable batteries. Note that you should get 500 full recharge cycles from empty – but if you recharge from half empty, you’ll get 1,000 recharge cycles. The smallest of the New Trent batteries, the iTorch includes both a bright LED flashlight and a laser pointer. Why you would need a laser pointer in a portable battery remains unknown, but many people have reported that it’s a lot of fun to have a handy laser for entertainment. Not just a gimmick, the iTorch has a single USB port to help charge your devices – although it will only charge at standard USB speeds. 5,200 mAh at industry-standard 80% efficiency, which is just about enough to fully recharge an iPhone 5S twice. It’s also enough to power the LED flashlight or laser pointer for 24 hours. 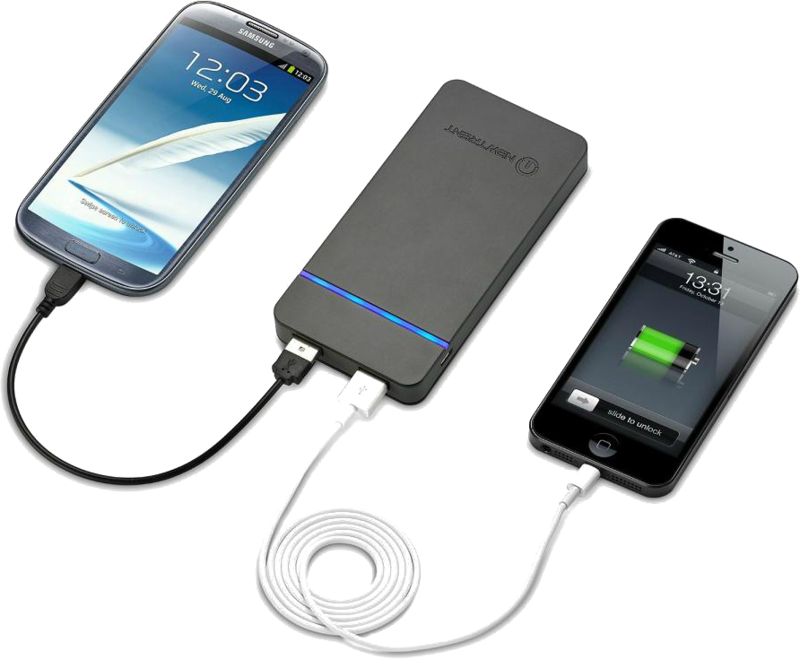 One charging port with 1.0-amp output, the standard USB 2.0 recharging speed. This is an acceptable speed for recharging smartphones, but it’s not fast enough to recharge a tablet while the tablet is in use. It will take about two hours at this speed to fully recharge an iPhone 5S, where one of the larger New Trent batteries reviewed above could charge it in about an hour. 4 inches long by 1.8 inches wide by 0.9 inches thick, making this a very small battery – as befits something you might hold in your hand while using the flashlight or laser pointer. It weighs 4.4 ounces, which is about the same as an iPhone 5S or other modern smartphone. Like other batteries from New Trent, it comes in high-quality and fingerprint-resistant plastic black matte. It includes a micro-USB charging cord. Small and lightweight, the iTorch is ideal for anyone who needs just one or two charges during a busy day, as well as anyone who just wants to drop it in their backpack in case they need extra emergency power or a flashlight at night. They’re practically identical – both use the same process for storing and releasing energy, lithium-ion, but the lithium-polymer batteries have a soft plastic shell instead of a hard metal shell. The soft shell saves some money and can help make the batteries a bit smaller physically. However, if either the plastic or metal shell gets punctured, it will leak toxic chemicals, so all the portable batteries have hard outer cases. The red laser pointer is about the quality you’d get on any sub-$50 laser pointer. (Many more expensive laser pointers have switched to green LEDs) The LED flashlight provides about 20 lumens, which is quite bright compared to old-fashioned incandescent light bulbs but not as bright as a high-quality $20 LED flashlight which can provide 50 lumens. The downside of both is that they can be turned on accidentally if the iTorch bumps around in your backpack, which will drain your battery. The only solution is to keep the iTorch in a hard case like an case for eyeglasses. Yes. All countries use the same USB standard, so if you buy a USB charger from the local electronics store in your host country, it will charge the iTorch. You can also connect your regular charger to a travel adapter, or even connect your laptop to a travel adapter and then recharge the iTorch from your laptop. The New Trent batteries have innovative designs that go a long way towards negating their short warranty period. Although its efficiency is surprising low, the PowerPak Ultra with its water resistance is the big winner here – outdoor-ready batteries are a huge boon for athletes and explorers.